Porro binoculars are commonly regarded bulky, antiquated, generally not up to technical standards or simply out of fashion. On the high end market, they are absent altogether, the medium range offers a few of them, which are collecting dust on the store's shelves, while only in the supermarkets, cheap Porro models are selling well for a couple of Euros. A few gems still exist, but it requires more than a bit of insider knowledge to come to know about them, locate and order them on the Internet. In my opinion, this is a sad situation, and - in fact - the Porro design has deserved better than dwelling inside the closets of a handful of binoculars collectors and historians. Why do I think so? Being somebody who is interested in binocular technology, who likes to know how these instruments function and perform, I have learned to appreciate simple solutions. Optical instruments are machines that modify light, and light is a rather ethereal entity that has to be treated with great care in order to preserve its valuable information content. The image reversal prism is a necessary, though unpleasant optical group of the binocular - a block of glass that is not only heavy, but contributing the bulk of the optical glass path which has to be traveled by the light, longer than the glass paths of all lenses taken together. Transparency, color hue, bubbles, inclusions and mechanical strain are but a few of the issues which the prisms are involved with. Astronomers are happy to leave them out of the optical path altogether and rather watch the planets upside down than messing around with these bulky blocks of glass. But with modern binoculars, there are additional issues. 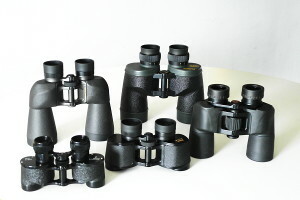 Most roof-binoculars are of the Schmidt-Pechan type (left figure), which is favored over alternative designs because of its outstanding compactness. An entire bunch of technical problems are coming along with this prism: The total internal reflection of the light beam fails at the lower left edge, because the incident angle is too steep. This requires an external mirror, coated on top of the surface (blue) in more than 30 dielectric layers of highest precision, before approaching the reflectivity of the total internal reflection. 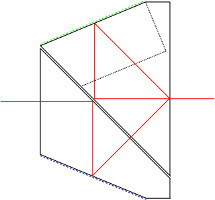 On the second prism, there is the roof (here seen as a projection of one of its flanks) which has to be coated with another "P-coating" to reduce polarization effects of the beam and a corresponding loss of resolution. The roof edge, shown in green, is cutting right through the cross-section of the light beam and adding a diffractive distortion that generates the well known spikes when imaging intense light sources. 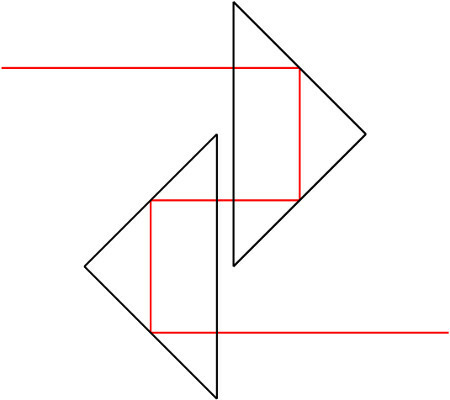 The air-space between the two prisms is narrow, but necessary - the both blocks cannot possibly be cemented together. But it comes even worse: The prism faces, which are separated by the air-gap, cannot be multi-coated without triggering the side-effect of a contrast reduction (see: Konrad Seil, "Progress in binocular design", Proc. of SPIE Vol. 1553, p. 48, 1991). This is so because these surfaces have to serve a dual purpose, a total reflection and also a transmission of the light cone. Total internal reflection does not remain unaffected by the external coating layers, leading to the image degradation mentioned by Seil. On the contrary, the Porro prism (right figure) makes matters very easy for the light cone to pass: Four times of perfect internal reflections without the need of any special coatings, apart from the standard anti-reflex coatings at the prism entrance and exit. The air-space between the two prisms can either be left open and the corresponding surfaces be multi-coated without any side effects, or the prisms are cemented to eliminate any transmission losses altogether. 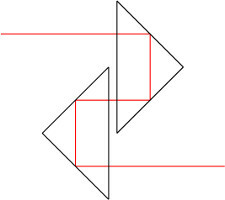 Porro prisms are bulkier than Schmidt-Pechan prisms: The weight of a symmetric Porro is 11% higher than that of a Schmidt-Pechan with identical entrance diameter, and the Schmidt-Pechan is also both shorter and significantly slimmer. Its glass path, however, is 16% longer than that of a comparable Porro, due to the multiple folding of the beam. Tolerances during the process of shaping differ dramatically: The 90 degree right-angle of the roof-edge has to be accurate to a few arc seconds in order to guaranty a high resolution - compared to these numbers, tolerances of the Porro geometry can be relaxed by a factor of ten. Modern technologies allow manufacturers to make high end roof prisms that rival the optical performance of the Porro - but not its simplicity and conceptual elegance. The making of Porro binoculars of highest optical performance would be possible, and with very competitive price tags - if only they were asked for by the consumers.